LEXINGTON, Ky. (May 16, 2018) — You've probably passed by it on your way to shop, eat or even work. The rolling green land that sits across from Wal-Mart at the corner of Man-O-War and Nicholasville Roads (and caddy-corner to The Summit) is much more than just a pretty piece of land. It's a vital part of the University of Kentucky's past, present and future. 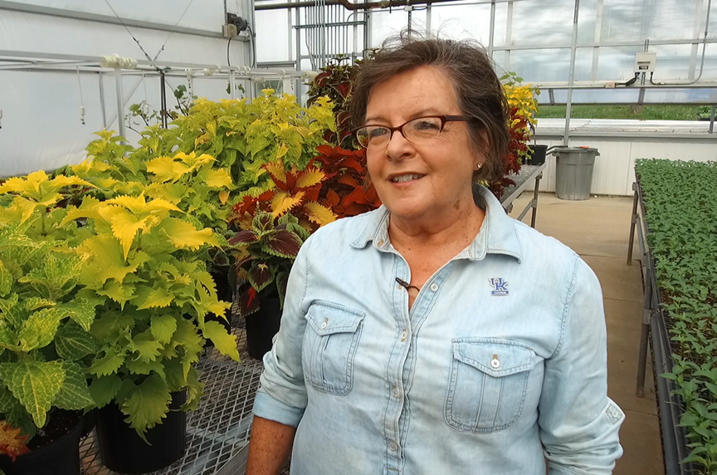 In this edition of our "Campus Walks" series, we'll explore the UK Horticulture Research Farm with College of Agriculture, Food and Environment Dean Nancy Cox. Watch why this farm is symbolic of the teaching, research and service that is conducted throughout the college both here in Lexington and across the Commonwealth. Nancy Cox is now in her fifth year as dean of the University of Kentucky College of Agriculture, Food and Environment. She is the first woman ever to hold the position. Cox came to UK from Mississippi State University in 2001 and served as the college's associate dean for research for 12 years. As dean, she oversees about 2,800 employees in all 120 counties and the tripartite, land-grant missions of education, research and extension. The college has 14 academic departments and 18 majors, and is second to the College of Medicine in grant dollars at UK. With a background in animal science, she has overseen growth in the UK Veterinary Diagnostic Laboratory and UKAg Equine Programs. Additionally, Cox is a strong advocate for partnerships through which Kentucky’s farms and families can thrive. The Grain and Forage Center of Excellence, now under construction thanks to many partners, is a prime example of the college’s successful efforts in this area. As dean, she represents the college and university on various state boards and commissions, including the Kentucky Farm Bureau Federation, the Kentucky State Fair Board, the Kentucky Horse Park Commission and the Agriculture Development Board. These videos are part of a new, bimonthly UKNow series called "Campus Walks." During the next several months, we will be featuring the deans of our colleges. The idea is to get out of the office and onto campus with members of the UK community, so we can have in-depth, authentic conversations about our university with the people working so hard to advance our mission of education, research and service. Special thanks to Brian Volland in the UK College of Agriculture Food and Environment for aerial footage used in this video.